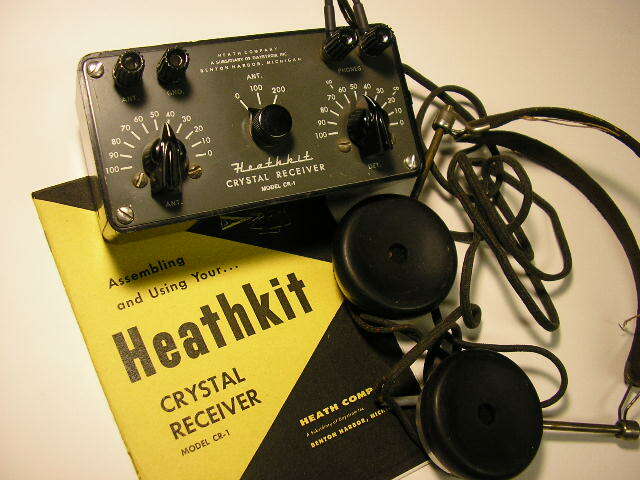 My father built this Heathkit CR-1 Crystal Radio for me for my birthday when I was in the 5th grade, circa 1959. I helped ;0)….. It was a magical device and it got me seriously interested in radio at an early age. I didn’t even realize that the absence of a battery was itself quite an accomplishment. It worked great – keeping me up all hours of the night trying to discover its range limits. In the process I began to learn about what could be used for an antenna, the differences between 1N34’s and power supply rectifier diodes, and why speaking into the headphones would not produce a transmitted signal into the antenna. That should work, right? Wrong…. 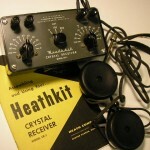 (I learned after looking through a Heathkit catalog that that feat would require a radio TRANSMITTER! I would drool over actual transmitters in the catalog that could do this – like the DX-100 which I would eventually own). Note the markings on the right-hand “DET” dial. That was the Detector tuning capacitor. Those little CD (Civil Defense) markings were the frequencies set aside (640 and 1240 KC) in the AM broadcast band for CONELRAD alert messages. These markings were required on all radio receivers built between 1953 and 1963, including this one. COntrol of ELectromagnetic RADiation. Measures taken by the USG to prevent Soviet bombers from homing in on our AM broadcast transmitters as the Imperial Japanese Navy did during the attack on Pearl Harbor. The transmitting sites would change every several minutes as they broadcast emergency information messages. WGBB on Long Island was such a station. A crystal radio would have been very handy at that point. 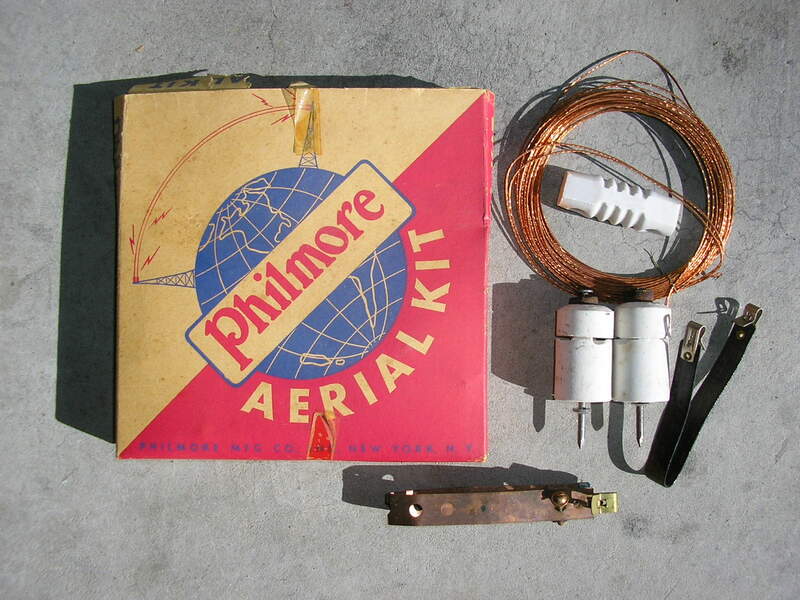 My Dad installed a Philmore Aerial Kit with its shiny stranded copper wire along the eaves of our house, using TV twinlead standoff ‘s for end insulators. I think the kit originally had two transparent glass insulators for the antenna ends which we didn’t use for some reason. This kit had the porcelain “post” insulators to hold the lead-in in place and a cool conductive strap with Fahnstock connectors at each end to feed the signal under a closed wooden window. There was also a cool copper strap with its own Fahnstock clip which went around the hot water radiator pipe in my room for a ground. Uninsulated, shiny, stranded copper wire antennas just work better than antennas made with “regular” wire ! Fun times – I still have the CR-1 and it still works great although the “chicken head” tuning knobs and headset are not original. I’ve built a lot of crystal radios but this one still works the best; due to careful antenna – diode – headset impedance matching. During WWI, WWII and later conflicts, many GI’s built “Fox Hole Radios” to listen to news, music, Tokyo Rose, Axis Sally, Lord Haw Haw and probably Hanoi Hannah too. 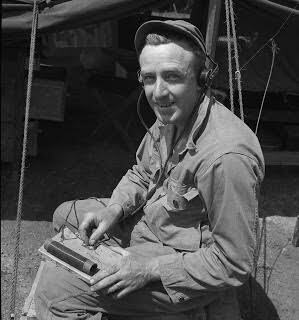 Although the enemy propaganda was laughable, those stations attracted GI’s with their popular music pumped out by powerful radio transmitters. The BBC, Radio Australia and US Armed Forces Radio Stations would carry news from home, music and the all-important sports scores. These Fox Hole radios did not require batteries – they were powered by the signal from the distant radio station as collected by the receiver antenna. They were built and used during the time spent in the “Wait” part of “Hurry up and Wait”. Often in a fox hole. If you were there, you know. The radio could be built from basic scrap, with the exception of the earplug or earphones; those could be liberated from that enemy tank or aircraft wreckage. That perforated Messerschmitt or Betty could also be a source for the necessary wire for the antenna tuning coil and antenna. The radios were built by the young GI’s who just knew how to make such things. They were the equivalent of today’s techno-geeks and computer hackers (but not the modern kid who thinks “communications technology” is poking their finger at the screen of a Chinese-made iPhone. I’m not interested in those things, but I digress). This was early 20th century technology and any self-respecting GI was up on it. The omnipresent Ham Radio operators in the Signal Corps probably helped, applying their skills of the day. I built the Fox Hole Radio described below after a friend produced a WWII Red Cross package containing razor blades among other common items. 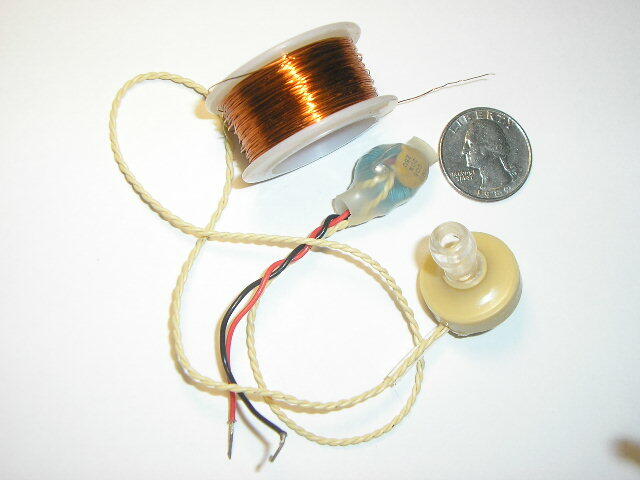 These were the “Blue Blade” type that had a blue oxide finish, and that finish, in contact with an ordinary pencil “lead”, made a point-contact rectifier. This served the purpose of the “crystal” and “cats whisker” of early crystal radios; it permitted current coming in from the antenna to flow in only one direction. This served to “build up” the antenna signal to a level that could be heard in the earphones by a process known as “detection”. 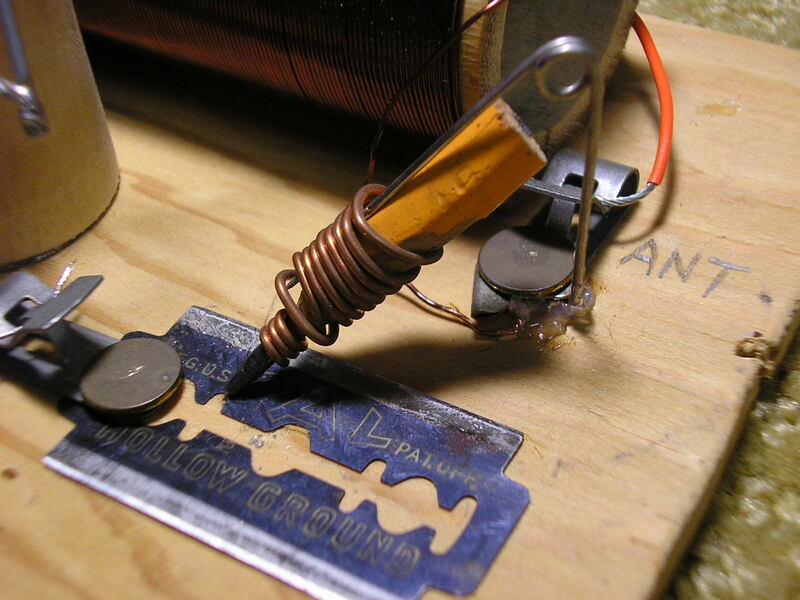 An attached coil of enamel-insulated wire wound on a piece of bamboo acted along with the antenna wire capacitance to produce a tuned circuit, tuned approximately to the radio frequency band of interest. Experiment with the circuit – you can “short out” coil turns with the paper clip tuning tap; better yet, you can just connect the tap to the razor blade/earphone circuit instead, a more common configuration. This one is REAL basic – but impedance matching and having a healthy signal are the keys to performance. All that was then required was a long piece of wire for an antenna (that barbed wire fence with wooden posts or a length of infantry telephone “commo wire” was perfect). 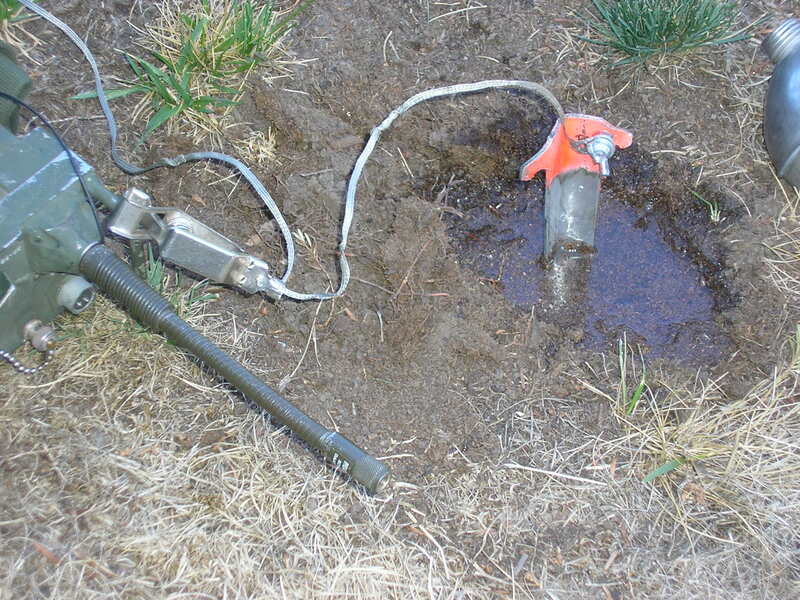 Plus a ground connection consisting of a metal tent stake or bayonet stuck into the moist soil. Above: A typical improvised “ground” connection. A metal tent stake pounded in the ground, kept moist. Here, grounding a PRC-25 radio set. You get the idea. A few other bits such as a safety pin, a piece of bamboo, plastic water bottle, glass bottle or toilet paper cardboard tube for the tuning coil form. Then a piece of wood from that ammo crate for a chassis, a few screws, thumbtacks or nails and a paper clip to make a “tuner”. In the presence of a strong signal and/or a good antenna it is hard to make this type of circuit not work! The below photos illustrate the basic idea. Above: The Fox Hole Radio built with a WWII-era “blued” razor blade and pencil lead for the detector. Note the bamboo coil form and the paper clip attached to a cork used to slide along the coil turns to tune the radio. The orange wire goes to the antenna, the black wire to ground. This is the “Deluxe Model” with spring-clips for the external connections. Above: Showing the detail of the safety pin used to hold the pencil lead against the razor blade. The copper wire connects the “lead” to the safety pin and the antenna circuit. This assembly functions as the “Cat’s Whisker” of classical crystal radios. My cat was especially appreciative of this alternate design. You can also tune the radio by changing the inductance of the coil – make its inductance bigger for lower frequencies by inserting an iron bolt into the bamboo coil form. Or make it tune higher frequencies by reducing the coil inductance by inserting a piece of brass – that .50 Cal machine gun cartridge works just fine. Improvise, adapt, overcome. This radio will also hear local AM voice radio transmitters like those used throughout WWII and beyond for military communications. If they are close enough, you don’t even have to tune the radio! They come in perfectly clearly. These Fox Hole Radios radios were undoubtedly used clandestinely in POW Camps by very brave people. If you had a Fox Hole Radio, you were the Go-To GI for the straight skinny; you actually KNEW what was going on. The Gillette company produced Blued razor blades for the war effort. Interestingly enough, if you look at one of those, it includes a small arrow printed on each side of the blade, ostensibly to indicate the way to insert it into the razor. (The blade used in this Fox Hole Radio was not made by Gillette). Gillette manufactured these blades and then voluntarily magnetized them for use by POW’s as a field-expedient magnetic compass. When suspended by a thread, the arrow pointed North. (“The Escape Factory”, Reference 6). Thanks guys. The above circuit is very simple. 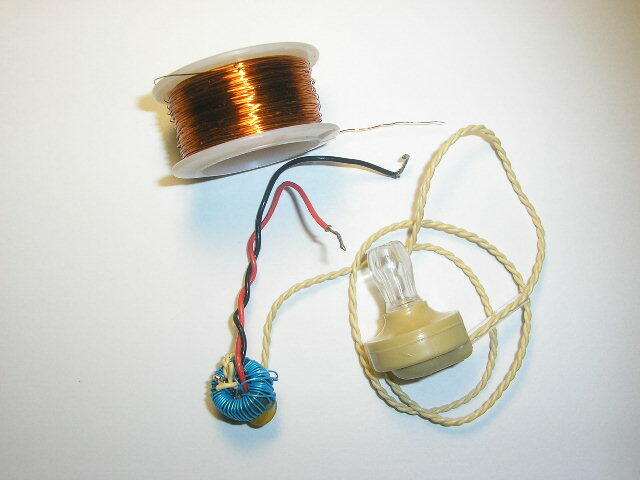 It consists of a parallel LC tuned circuit where the inductor is a 1/2 inch diameter toroid wound with about 55 turns of small gauge “Kynar” wire-wrap solid copper wire. Enamel insulated magnet wire will work fine as well. With this particular toroid, 55 turns produces about 12 microhenries. The antenna is connected to one end, ground to the other. The parallel “tuning” capacitor is a random 0.005 microfarad disc capacitor found in my scrap pile. A 1N34A germanium diode (anode) is connected to the antenna end of this parallel combination. A high impedance crystal earplug is connected between the diode cathode and ground. Since these crystal earplugs look like a very high resistance in parallel with a capacitance, this capacitance will charge up to the peak diode voltage and then stop the earplug current flow. (Not an issue with high impedance magnetic earphones commonly used. 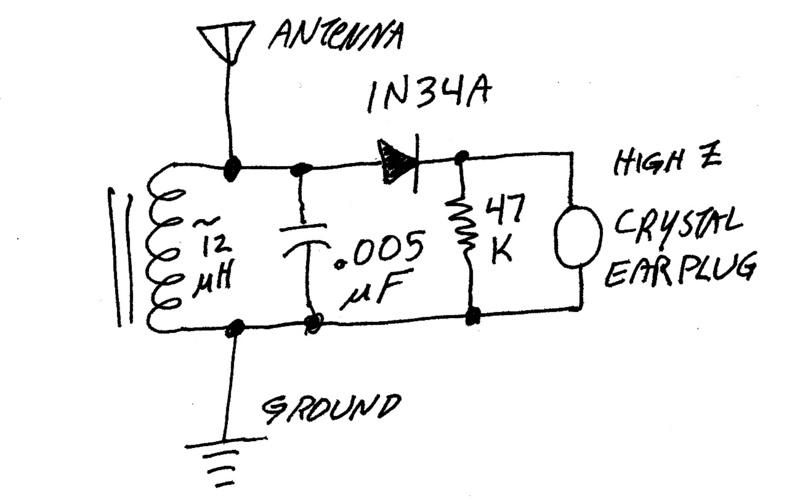 Eg: The Heathkit CR-1) To prevent this, place a 47K resistor across the earplug to drain off this charge. The resistor costs a little signal but it’s necessary; value not critical. A potential gremlin, easy to overlook. 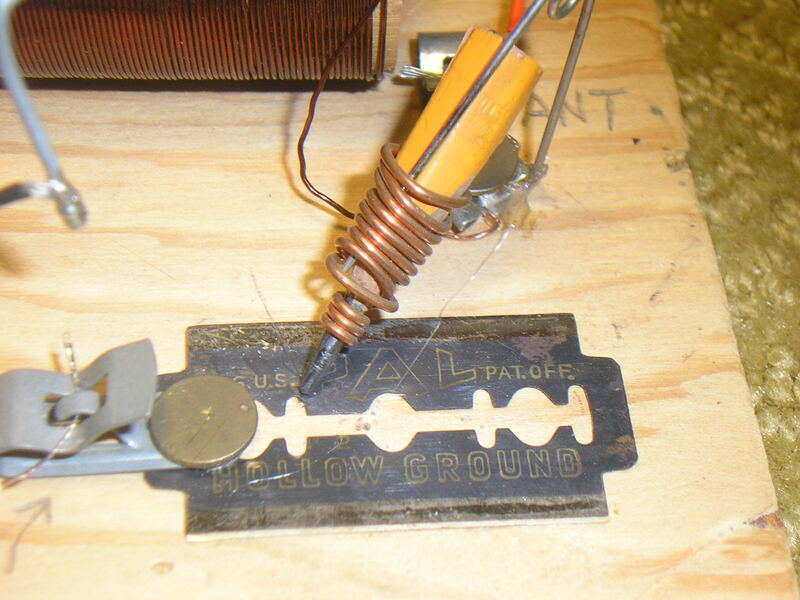 (The Razor Blade foxhole radio did not need this discharge resistor. I believe the “reverse leakage current” back through the improvised diode effectively discharged the earphone capacitance through the coil). The LC circuit is resonant at around 650 KC with these values but I used a “junk box” toroid with unknown permeability. Experiment with the toroid, number of turns and capacitor to see what you have and how many turns are required to get to the broadcast band. Nothing is particularly critical. Just make sure you use a germanium diode like a 1N34A due to its lower forward voltage drop as compared with a typical silicon diode (improves sensitivity for weak signals). “Tuning” is very broad due to the overall simplicity and design compromises to make it as small as possible. The LC ratio is not remotely optimum, circuit “Q” is unknown but it is simple, built with what I had, and it works! 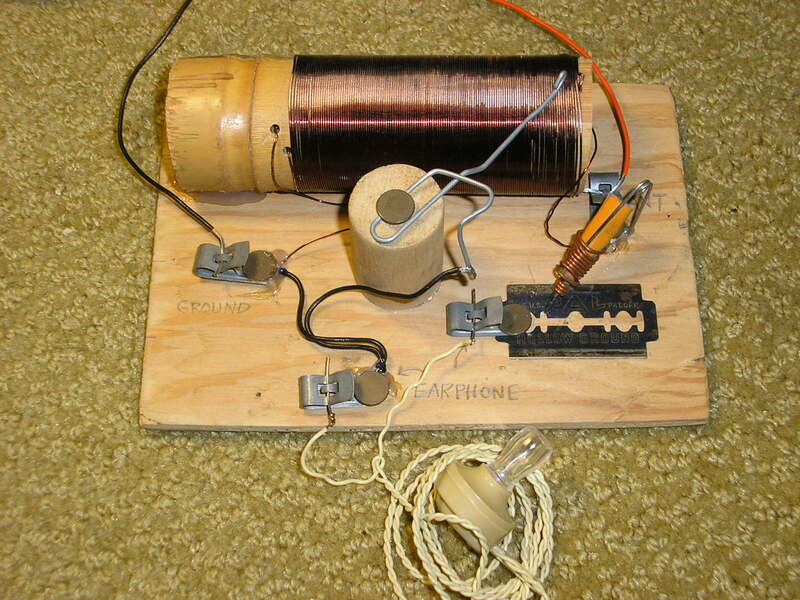 The internet is full of crystal radio circuits – explore and experiment! 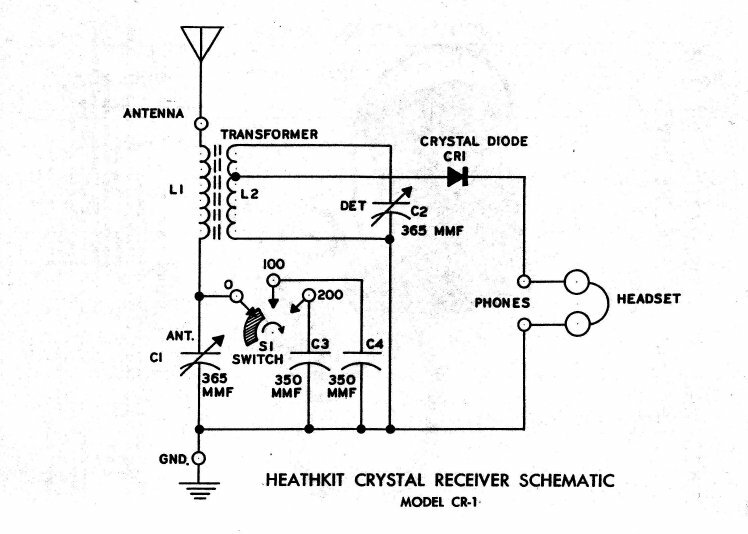 Last time I searched for “Crystal Radio” Google returned 63,000,000 results! Below is the same radio after being “field-hardened” by inserting it inside some heat-shrink tubing to protect it. The diode and resistor are tucked inside the toroid “hole”. The yellow disc capacitor is visible. You can see the small size and this is perfect for keeping inside my pocket emergency kit. Mine is fixed-tuned at about 650 KC; you could build it to prefer any frequency but it is really “broad band” by nature. In the San Francisco bay area I can clearly hear KGO, KCBS and KNBR (810, 740 and 680 KC respectively) during the day and primarily KGO and KNBR at night as some stations must reduce transmitter power at sunset. Operation is simple: Unwind the antenna wire and toss it up into a nearby tree with a small weight on the end. Keeping it vertical works best since the AM transmitters are vertically polarized but it works in any position. Of course, performance depends upon your proximity to AM radio stations, their power output, their frequency separation from each other, the length of your antenna and your ground connection etc. The antenna is connected to the red wire, the black wire is connected to “ground” (however switching those connections works just fine). Ground could be a metal tent stake or a knife stuck into wet soil, another piece of wire laying on the ground, the proverbial “cold water pipe”, that barbed wire or chain link fence – anything metal in contact with the Planet. In regions where the ground conductivity is very poor (desert, rocks) you can cut the antenna wire in half and connect half to the red wire, the other half to the black wire making a dipole with the radio in the middle. That’s it. Stick in the earphone and you are in business. Plus, you don’t have to “turn it off” when you fall asleep! Making it tunable is easy but that requires a rather large variable capacitor and “knob” and even in that case, it is still pretty broad in its tuning range. I chose to keep it small and simple and use my ear-brain to do the tuning. Actually it is pretty easy once you are “tuned in” to the specific program you want to listen to. To Tune in a different one, just change your concentration! Works better than it “sounds”. You could make it completely waterproof (less the earphone) by squirting a small blob of clear silicone “liquid nails” or hot glue into the ends of the heat shrink tubing to fully encapsulate it. Simple, no-frills and effective with design tradeoffs to minimize complexity and size. Perfect for emergencies when everything is “out”. Another fun exercise is to demonstrate these radios for your local youth groups. In that case, you can also have them play with the basic Foxhole Radio circuit but with using alternate detector materials rather than the razor blade or a germanium diode. 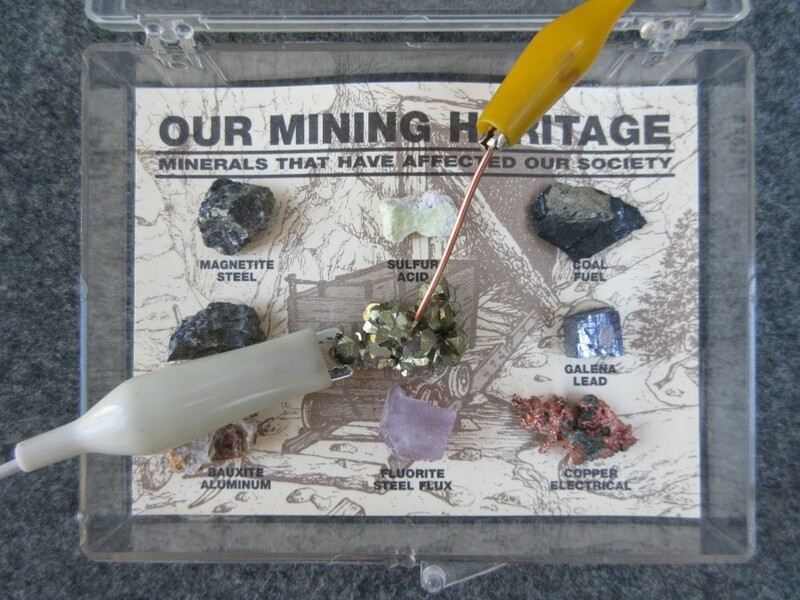 Have the kids try various minerals from your handy-dandy minerals collection assortment or rocks they find locally. Some work, some won’t. 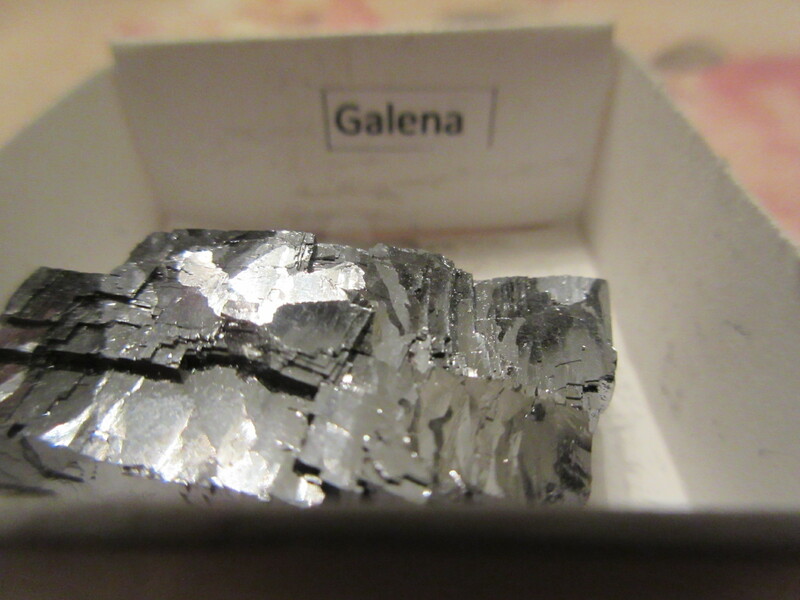 Galena works well, or try iron pyrite (iron sulfide – or “fools gold”). That mineral also works. 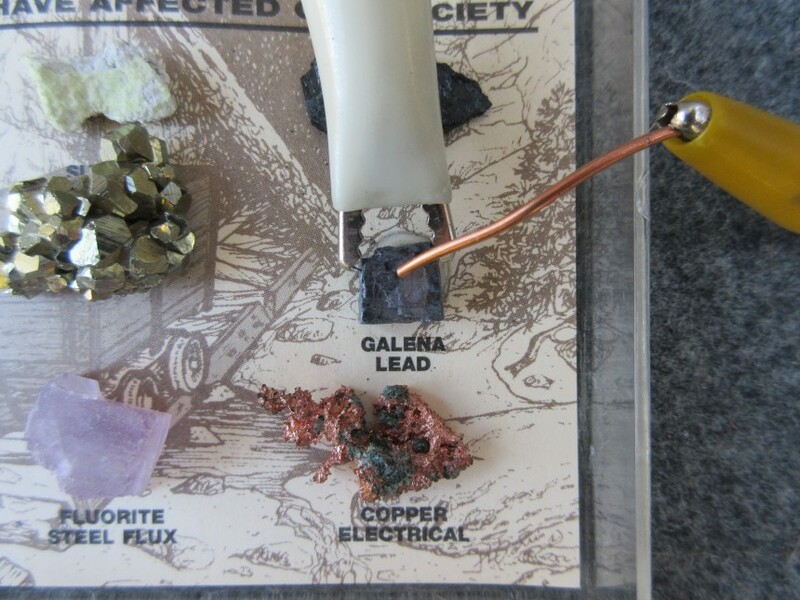 After connecting the mineral to the Foxhole Radio tuning coil, have the kids probe the surface of the mineral with one wire from the earphone. When they hear a radio station, eyes LIGHT UP! WOW! Fun. Any future Engineer or Scientist worthy of the title will quickly reveal themselves via their ensuing curiosity. Hi Lee – Yup, those early radar receiver diodes were the first packaged diodes one could obtain beyond the chunks of galena used previously. The 1N21 and 1N23 microwave mixer diodes were provided to a British relief society who were sending aid packages to allied POW’s in Germany. The Germans passed the packages on to their camps. The diodes were built into common objects and the POW’s with special briefings (usually radio operators) knew what to look for. The diodes were then built into crystal radios. The Escape Factory is a good book detailing the operation. I built one of these and actually got a couple of DX stations! Most of the time you can only get locals on a foxhole radio. I’ve read that the soldiers in WWII in Europe were listening to stations about 30 miles away. When I was a teenager, the stations that I could hear were about 30 miles out. I’ve heard that in WWII American soldiers would listen to Japanese transmissions from airplanes with foxhole radios because they wouldn’t make RF that would come out of a superhet tube set. I heard WGN 720 Chicago and WJR 760 Detroit. Both 300 miles from where I was. The most distance I have ever heard anyone else get on a razor detector was a guy who got KMOX 1120 St Louis from 100 miles away. I’m a science writer based in London, and I’m working on a piece at the moment about radio communications, including a section on the incredible ingenuity of the POW/Foxhole radios. I’d like to be able to reproduce your photograph of the razor blade rectifier – would that be ok? Hi Lewis – Sure, please feel free to use the photos…. Maybe you can send me your article when you are done – I’d like to see it..
You might also be interested in a (paperback) book called The Escape Factory by Lloyd R Shoemaker (1990). It details the work of a US organization (MIS-X) that designed and built escape devices being sent to the POW’s in Germany via a British “relief” society. The materials were secreted inside various items being sent to the POW’s. There is an X-Ray photo of a crystal radio that had been built inside a wooden cribbage board. Moving the little pegs tuned the radio to different frequencies.. VERY clever.. I have built many of the “fox hole” radios. I used to teach my electronics students in college courses about the Fox Hole radio. Some even built them. I am a radio ham and was roped into making crystal radios with my son’s scout troop by the leader. They initially built them using diodes and then we swapped to the improvised detectors. I made up a galena cats whisker detector, a pyrite cats whisker detector and the blueblade detector using a blued utility blade all worked and received the football game from a transmitter around 50 miles away. The scouts were really knocked out by getting them to work. Thanks for visiting my site & 73! I had a very small crystal set butlt into a fountain pen. We used to listen to the world series during class. i palmed a small ear phone in my hand and leaned on my elbow to conceal it. The hard paer was hooking up the atenna and groundwith out the teacher seeing it ,That and keeping you mouth shut if you team hit a homer. I built a foxhole radio from the Grolier book of knowledge in 1954. I had a customer on my paper route who had lived on P.E.I. as a kid . there was no electtricity yet, but the radios that had coils built on light bulb bases , so they could change ferquencies . The attennas wer strung up on what amounted to tellephone poles. The had several and which ever one was not being used for radio was connected to a light bulb and lit by the RF. Haven’t thought about this in years . Lots of fun. Great strories; the comentaries so joyful, I tryied my first set at ten w/o much any information not to say about materials… sure didn’t work but the spark has not ever extinguieshed; got into audio Transistor and ICs power and signal too; into FM circuits trying to make my Hi-Fi system; now also onto Vacuum toobs; still on the go but to read on cristal sets always sparks my eye and having not made a definitive base set, all experimental tries, lots of coils, tons of variodensers lots of cristal diodes and lots of web diagrams keep me happy on the search of a new trick to make a really good cristal set; congratulations; sincerely. Hola Francisco – Sounds like you have learned a lot about electronics the same way I did. Curiosity is a great motivator, there are few substitutes. First time with a crystal radio was a “rocket radio”….Christmas of 1964. Lifetime of love affair with electronics (currently fix computers and anything else you can plug in) came honestly from my father. Does anyone remember the “Boys First Book of Electronics?” … still available digitally on the “net” …it has LOTS of nostalgia too. Can remember a MUCH simpler circuit for listening to anything broadcasting in Toronto in mid 60s. How about a crystal earphone, a 1n34a diode and the school yard fence. Worked great and learned about so called “cocktail party effect” listening (Vietnam vintage term??) when there were so many mixed up audio signals. Hi Stan – Thanks for visiting! Yep, many similar experiences on my end, a fun way to learn something that would eventually become a profession: Electronics! Next week I will be helping wean a young lad off video games and into learning how a crystal radio can be built and used…Curiosity is a great thing!